When you become a Mom, your purpose in life changes. It’s like the Earth shifts on its axis and instead of orbiting around the sun, you now orbit around a tiny bald human that will one day call you mom. You can head back to work or stay at home with your kids. You can nurse or formula feed. You can let them cry it out or you can soothe them to sleep. The fact is, you become their lifeline and your purpose changes a bit. I recently grabbed coffee at Front Porch Cafe with a sweet friend and fellow mom, Shannon Parra. As we chatted about all things motherhood and shared cute stories about our kids we got to talking about her 11-month-old son, Bodhi. 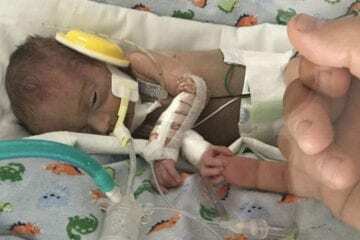 He was born at 24 weeks weighing just 1 pound, 5 ounces via emergency c-section due to a prolapsed umbilical cord. Sweet Bodhi has been a fighter since day one. Now that Bodhi is home and enjoying the Outer Banks life with his parents and his big brother, Gavin, Shannon feels like her purpose now includes fighting for the health of moms and babies. After experiencing four months in the neonatal intensive care unit at Children’s Hospital Kings Daughters in Norfolk, she knows that every baby deserves a healthy start. This year Shannon and her husband are proud to be the Ambassador Family for the March of Dimes here on the Outer Banks. The Parra family is passionate about spreading awareness to our community about the amazing work that the March of Dimes is doing so that 1 pound babies like Bodhi are able to thrive. While Shannon never expected to deliver her second baby boy so early, she learned so much during his NICU stay. 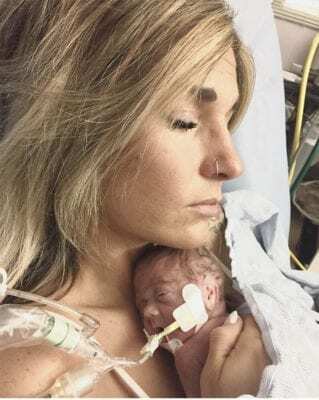 The work that the amazing doctors and nurses did and the science that saved Bodhi’s life is largely credited to the amazing research and fundraising that the March of Dimes does every single day. For Shannon, driving about 4 hours a day for a full 4 months to visit her son was a part of her survival mode. Bringing Bodhi home brought forth even more challenges, but with the knowledge that they gained in the NICU, she and her husband have nurtured their son to be the thriving and incredible little boy that he is today. If you live here on the Outer Banks, you likely know Bodhi or another sweet child who spent time in the NICU at CHKD. Thanks to programs like the March of Dimes, we have these sweet kiddos that add so much to our Outer Banks community. This Saturday, November 10th, you can join the March of Dimes to raise awareness and money to continue the research that saved sweet Bodhi’s life. The March for Moms and Babies takes off from Dowdy Park in Nags Head. You can help our local March of Dimes teams raise money by registering to walk at 1:30 p.m. or donating online. If walking isn’t your thing, dress up and attend the March of Dimes Signature Chefs Auction this winter. Lets join together to keep our tiniest Outer Banks residents healthy for the future of our sandbar.